This contemporary desk offers a sleek modern design crafted with durable steel . The L-shape provides a corner wedge for more space and the design creates a look that is both attractive and simple. This desk compliments any room and is a great addition to any home office. 6.Supports multiple monitors and desktop computers without concern of collapsing. L-SHAPED CORNER DESIGN - wide desktop & space saving, you will have plenty of surface space for writing, computer work and other home office activities. 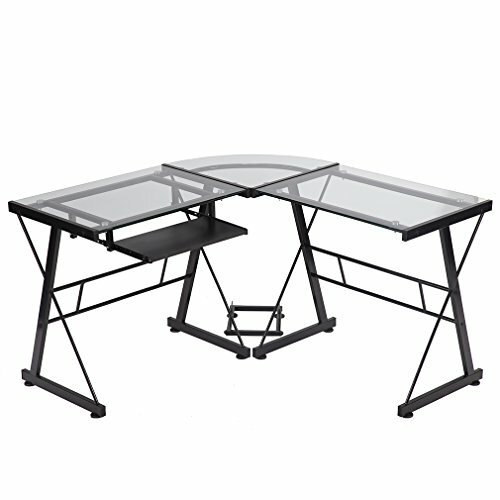 STURDY AND SCRATCH-PROOF TABLE TOP - 7mm tempered glass to greatly increase lifespans. KEYBOARD TRAY&CPU POWER STAND - Built with a slide-out keyboard drawer,and includes a stand for the computer tower to rest on. MULTI-FUNCTION USE - You can put this desk in your office,bedroom,living room,study room and other places, it can be used as a computer desk,study desk,side table,etc..
EASY CLEANUP: All the mess will be finished in one single wipe,convenient.